Goulburn Valley Health (Shepparton Hospital) is the largest public health provider in the Hume region. To keep pace with the growing needs for modern health care the hospital received a redevelopment of its emergency department and the Victoria Police Blue Ribbon Foundation was proud to contribute $250,000 towards the purchase of new equipment. This project was undertaken jointly with the local community through the Shepparton Branch of the Victoria Police Blue Ribbon Foundation. The revamped emergency department was provided with a new ambulance bay, three additional emergency treatment areas, a Short Stay Unit and overall improvements to existing facilities including staff and public areas. The Shepparton Branch continues its work in the community so that further facilities can be installed in local public hospitals. The Eyre-Tynan Emergency Department at Shepparton Hospital is named in memory of Constables Damian Eyre and Steven Tynan who were murdered at Walshe Street, South Yarra on October 12th, 1988. Constable Eyre, who grew up in Shepparton, joined his father and brother as members of Victoria Police. A significant donation from the Victoria Police Blue Ribbon Foundation enabled the purchase of equipment for this life-saving procedure that treats certain tumours normally considered to be inoperable. It uses images from the MRI to guide an intense beam of X-Rays at the tumour. Best of all, this procedure is non-evasive and is handled as an outpatient service. The Tynan-Eyre Stereotactic Radiosurgery Unit at the Alfred was dedicated as a Police Memorial in memory of Constables Steven Tynan & Damian Eyre who were murdered at Walshe Street, South Yarra on October 12th, 1988. Opened in April 1999, the Tynan-Eyre Trauma Centre is used to stabilise and treat critical patients in the State’s central and northern regions. The extended facilities provide by the Blue Ribbon Foundation allows for more complex procedures and treatments to be performed locally minimising the need for patients to be rushed to Melbourne. Among the patients treated in this unit were four police officers shot during a siege at Kangaroo Flat just out of Bendigo. All four made full recoveries and were able to return to duty. 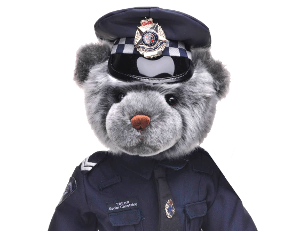 This project was funded as a partnership between the Victoria Police Blue Ribbon Foundation and the local community through the Bendigo Branch. It was the first major hospital project in country Victoria to receive funding from the foundation and was dedicated as a Police Memorial in memory of Constables Steven Tynan & Damian Eyre who were murdered at Walsh Street South Yarra in 1988. Epilepsy is a condition that affects many Victorians and has no age discrimination. Children are often born with epilepsy even though seizures don’t occur until later. Medication can control the disease but a surgical cure is often not possible. But the Epilepsy Monitoring Ward at the Alfred is using state of the art technology, and the resources of the MRI unit to provide patients with a selective, surgical cure for the disease. Funding by the Blue Ribbon Foundation has enabled the Ward to purchase the equipment necessary to selectively locate the brain area from which seizures emanate. In its first year of operation, surgeons were able to provide a total cure to just over 80% of the patients attending the Ward. Their target is to provide a cure for more than 8,000 epilepsy sufferers in the years ahead thereby enabling them to live full and productive lives. The Tynan-Eyre Epilepsy Monitoring Ward at the Alfred was dedicated as a Police Memorial in memory of Constables Steven Tynan & Damian Eyre who were murdered at Walsh Street, South Yarra on October 12th, 1988. This unit houses the hospital’s Magnetic Resonance Imaging system. Unlike other diagnostic processes, MRI provides doctors with more accurate images capable of detecting tumours as small as a pin head. Funding by the Blue Ribbon Foundation has enabled the hospital to purchase enhancements to the MRI to aid surgeons with pre-surgical computer imaging, simulations and the accurate diagnosis of multiple sclerosis. The Tynan-Eyre Diagnostic Unit at the Alfred was dedicated as a Police Memorial in memory of Constables Steven Tynan & Damian Eyre who were murdered at Walshe Street, South Yarra on October 12th, 1988. It was the first hospital memorial to be commissioned by the Victoria Police Blue Ribbon Foundation.